The purpose of this assessment probe is to elicit students’ ideas about infectious disease. The probe is designed to find out whether students use the germ theory to explain what causes an infectious disease like the common cold. This free selection includes the Preface, Introduction, Table of Contents, and the Index. The combination of both the activity for the students and the teacher guide is a great resource. By giving the reason behind the need for "probes," along with the Teacher Notes, it can provide the foundation for using it on other topics that we maybe don't already have the resources for. The probe might seem a little childish to high school students, but it event explains how to adapt it for them. 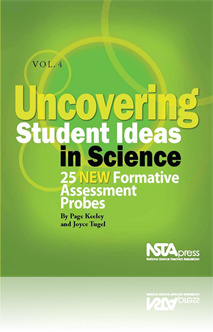 The probe that I investigated was a formative assessment probe aimed at debunking the germ theory. The teacher notes explain what a “germ” is and ways that we make it very easy for them to be transmittable. The article begins with how viruses attack your respiratory system and how certain symptoms you can display if exposed to viruses. This probe analyzes the misconception that cold weather triggers these “germs.” Through multigrade level applications students are able to understand health factors to keep you well, all the way to understanding different systems in the body and their interrelated functions. I think that this is a great source of information for teachers to use! I really feel as though this inspired me to discover some new PD for myself. I found the article was very easy to read and understand. I could definitely use this with my students to explain how colds affect the human body. I think that this article was great. I actually looked up some of the organizations mentioned to find out further information. I would love to try to implement this into our Science department PD days.